CUPERTINO, CA (PR Buzz) – June 29, 2015 – Always running out of time? Social entrepreneur and #ThoughtLeader Jorge Zavala (@jzavala) has a simple piece of advice to many executives and ordinary individuals who often complain about not having enough time: "Make time to have more time" Zavala explains how this can be done in his new AhaBook Making Time to Have More Time now available on the Aha AmplifierTM. The challenge every executive faces in today's world is having enough time to do everything. According to Zavala, CEO of Kinnevo (http://www.kinnevo.com) life is too short to waste complaining, so turn your anxiety into an asset in order to be more productive and efficient. In his social media enabled AhaBook, Zavala teaches us how to expand use of time by learning how to ask for help. Identify big problems that bother you, and turn them into small challenges. Ask people for help to find better ways to solve them. Zavala is known as a great international networker with a provocative style that moves people out of the comfort zone into action mode. That kind of provocative style has been applied to his company, Kinnevo, where it provides services on discovering ways to introduce and accelerate innovation in the early stage of projects to find solutions to everyday problems. "This AhaBook is guaranteed to help us find more time. Jorge Zavala has put together amazing AhaMessages that teach us how to covert challenges to simple actions," said Mitchell Levy, Chief Aha Instigator at the Aha Amplifier and CEO of THiNKaha (http://www.thinkaha.com). This AhaBook is now available for free on the Aha Amplifier. 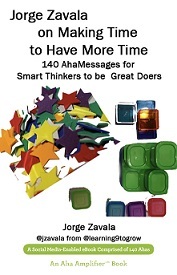 Read and share additional AhaMessages from Jorge Zavala's Make Time to Have More Time available on the Aha AmplifierTM at (please insert link to the book). The Aha Amplifier is helping to democratize thought leadership! This tool makes it easy for upcoming and existing thought leaders to increase their influence by amplifying quality AhaMessages™ (well thought out quotes containing up to 140 characters) on Twitter, LinkedIn, Facebook, and Google+. Authors in the Aha Amplifier create social media enabled eBooks (AhaBooks™) containing 140 AhaMessages. There are close to 25k AhaMessages available to consume and share. THiNKaha makes it easy to create compelling content that helps turn corporate experts into recognized thought leaders.THiNKaha services include curation for the Aha Amplifier, producing and repurposing content for the show Thought Leader Life, thought leadership mentoring/coaching, book publishing, webinar publishing, social media, traditional media coaching, vetted referrals, and many other thought leadership services, including the creation and support of corporations' thought leadership blueprints. To have us help your corporation amplify its thought leadership, please contact JenileeManiti at jenilee.maniti@thinkaha.com, or call (408) 257-3000.